I created the above birthday card for Wally. The pattern is by Sjaak Van Went and can be found in Hobbydol 136. Threads are Mettler Polysheen 0861, 0934, 1311. Die by Ultimate Crafts Rusty Old Ute. Elizabeth Crafts 1175, Dotted Scallop Edge. Happy Birthday die given to me by a very special friend. 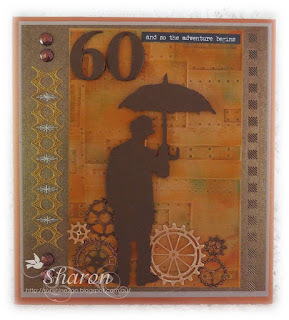 Background embossing folder by Stampin' UP! Woodland Textured. Enamel dots and string have also been added. Hope you are all having a lovely week. 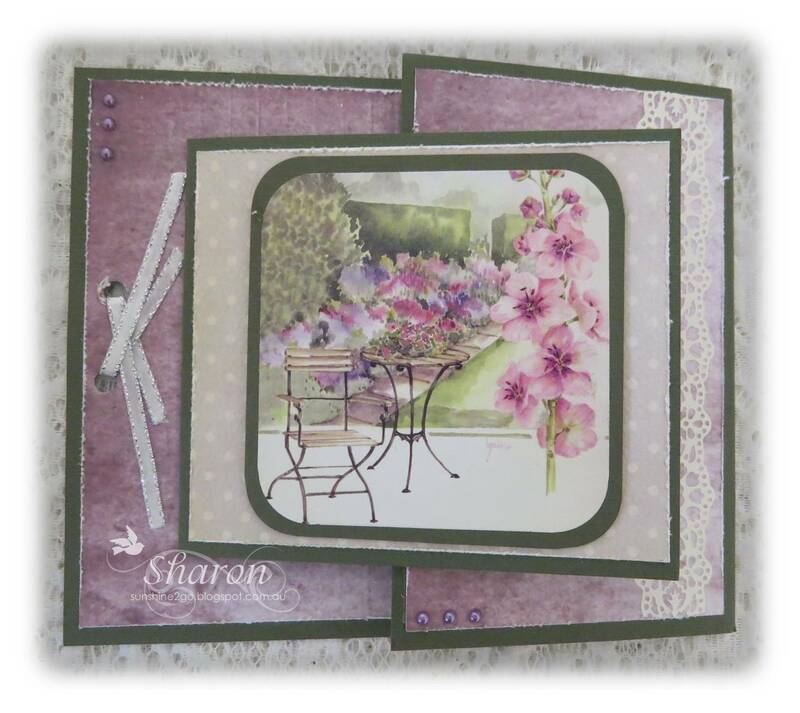 This month my friendship card was especially created for Sue. as it has beads added to it. Threads are Mettler Polysheen 0824, 3762, 3951. Elizabeth Crafts 1323 dancing butterfly. I created the above birthday card for Robyn. The pattern is by Sjaak CO-2018-049. Threads are Mettler Polysheen 0945, 1123, 4620, 5220. 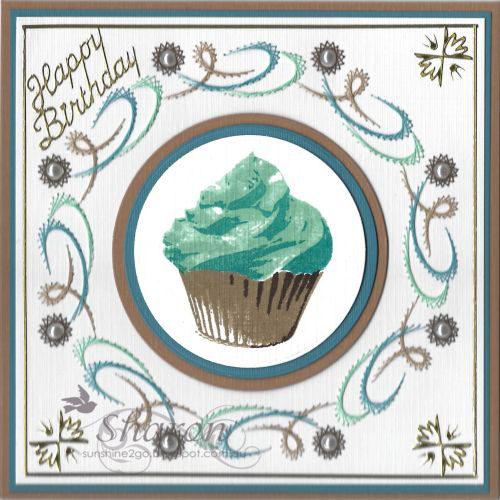 Cupcake stamp by Stampin Up! Peel Off stickers by Starform. 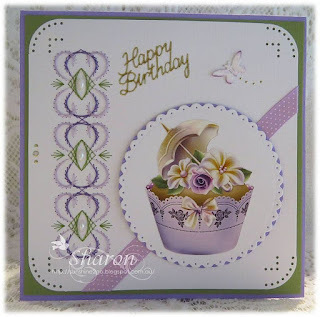 Labels: Ann's Paper Art, Nellie Snellen, Sjaak, Stampin' UP! This month my Mother In Law celebrated her 84th birthday. 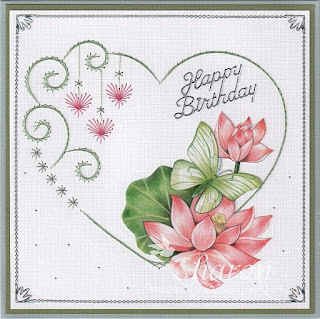 The pattern is by Sjaak Stitch and Do card only Set 17. Threads are Mettler Polysheen 2320, 5833. 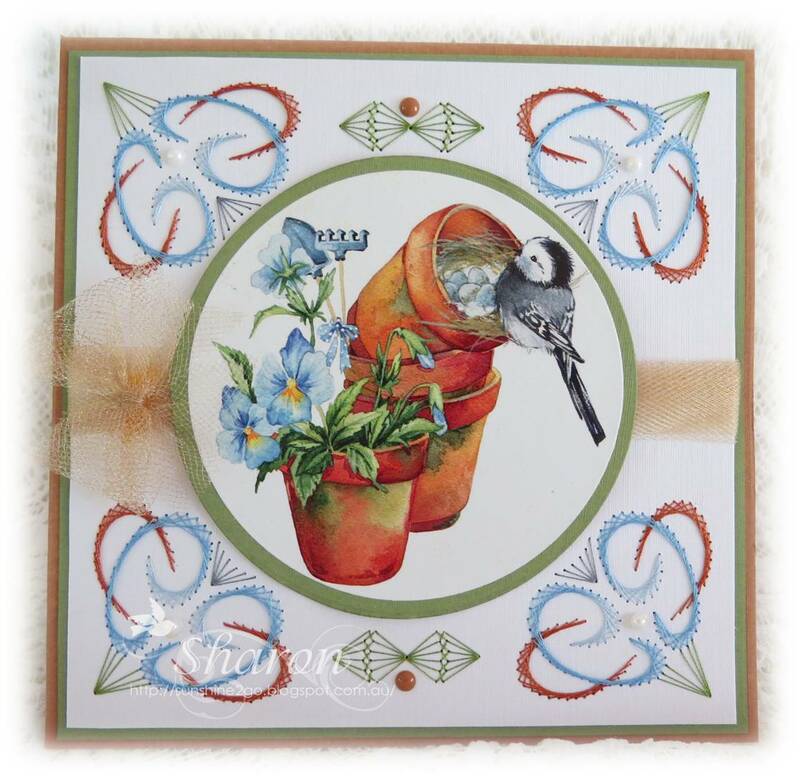 Decoupage by Ann's Paper Art APA3D017 Fairy Wrens. I hope that everyone is having a lovely weekend. I created the above card for Jackie as she was celebrating her birthday. The pattern can be found in Hobbydol #68, "Chrissie meets Forever Friends." Threads are Mettler Polysheen 0020, 0176, 2051. 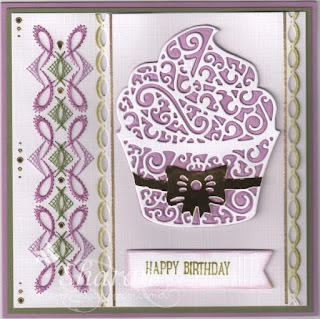 Stamp by Stampin' Up! "Beautiful You." Die by Tonic Studio "Piazza Window Box." Ribbon and jewels have also been added. 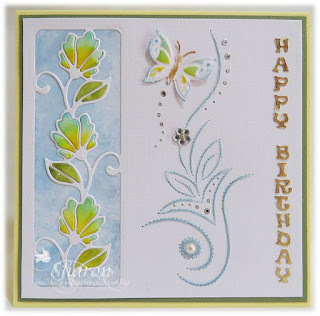 This month my card was especially created for Jackie. I only used a small portion of the pattern which is by Sjaak CO-2018-041. Threads are Mettler Polysheen 0453, 2764,5833. Scansilk 1817. Image by Marianne Design "Mattie's Moiste"MB0128. Verse stamp from Stampin Up! Beautiful You. Nellie Snellen Flower and leaf punch. 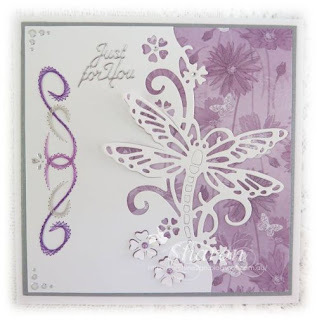 Tim Holtz Peeled Paint, Dusty Concord. Corner punch, ribbon, pearls and Wink of Stella. 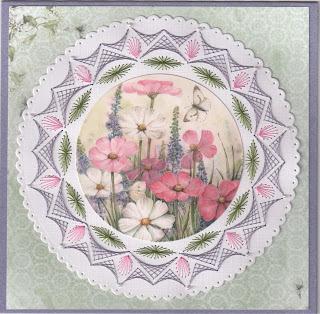 My friendship card for the month of June was especially created for Frances. Frances lives in New Zealand. 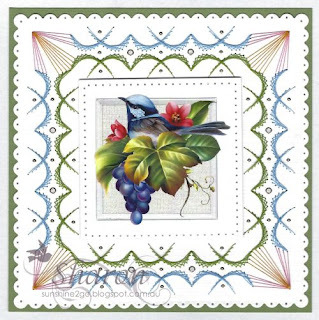 The pattern is by Sjaak CO-2018-053 and is available from Ann'a Paper Art. Threads are Mettler Polysheen 2920, 3040, 5833,6051. Background pattern paper by Studio Light. Wink of Stella added to flowers. The above card was made for my fabulous friend. Kerry and I have been friends for over 30 years. 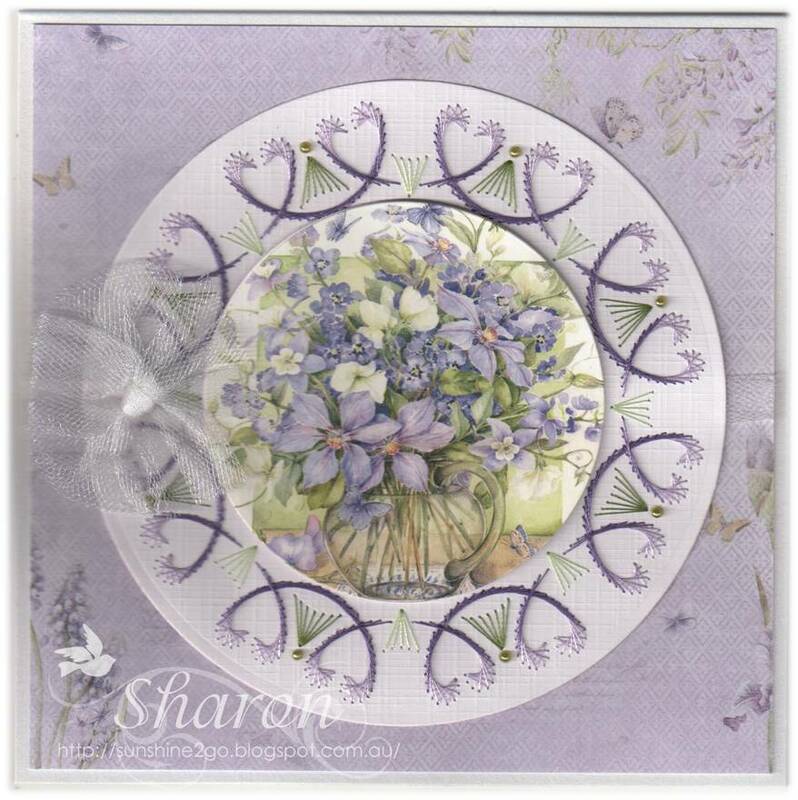 The pattern is by Sjaak 2017-020, it is available from Ann's Paper Art webshop. 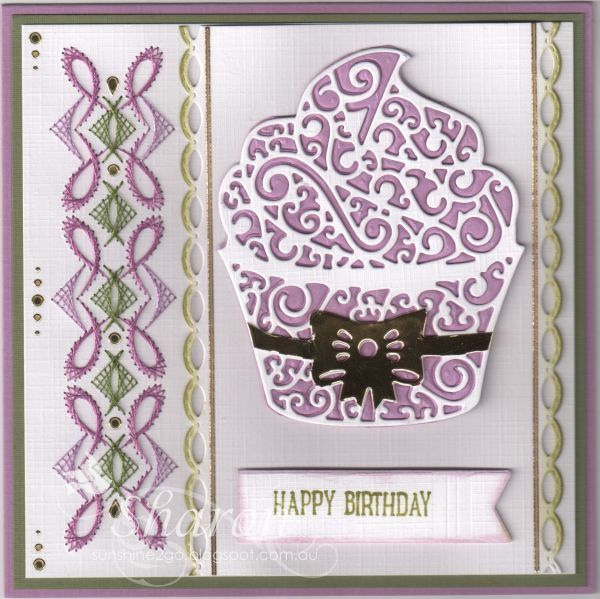 Cupcake die by Tattered Lace. 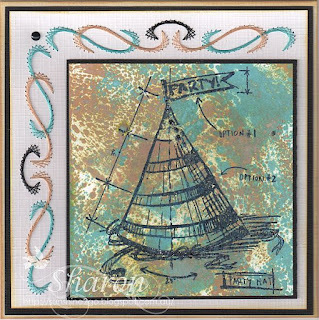 Popptstamp "Pretty Stitches" has been used along the edges. Stickers and Hobbydots have also been used. I hope that everyone had a wonderful week. We have been extremely busy of late. I created the above birthday card for Mark whom lives in England. The pattern is by Sjaak 2018-045 and is exclusively available from Ann's Paper Art. 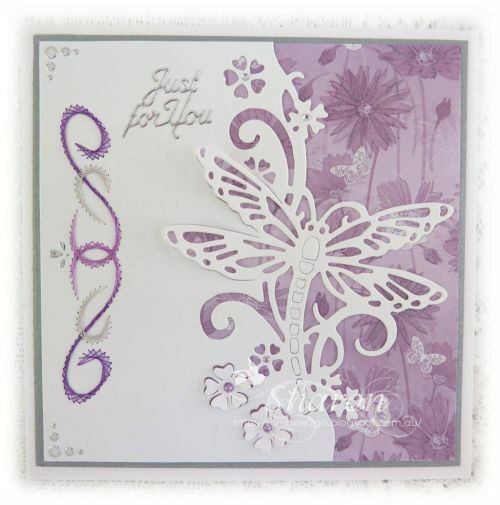 Come and have a look at all of the beautiful patterns that Ann's Paper Art have for sale. Threads are Mettler Polysheen 0605, 0853. Tim Holtz Stencil "Ray" coloured with Distress Ink "Wild Honey"
Main card die by Elizabeth Crafts "Stitched Square" 1118. 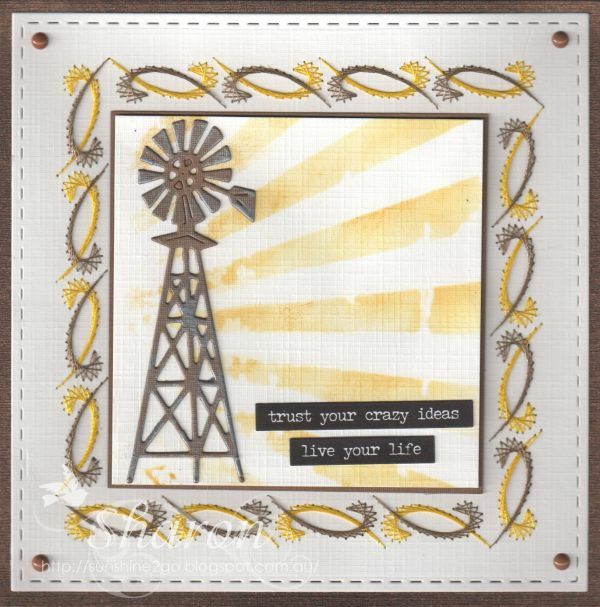 I added Creative Expression Guilding Wax "Pewter" to the windmill. My friendship card for May was especially created for Lucy. Pattern is by Sjaak Stitch and Do (card only) Set 15. Threads are Mettler Polysheen 0630, 2830, 5833. 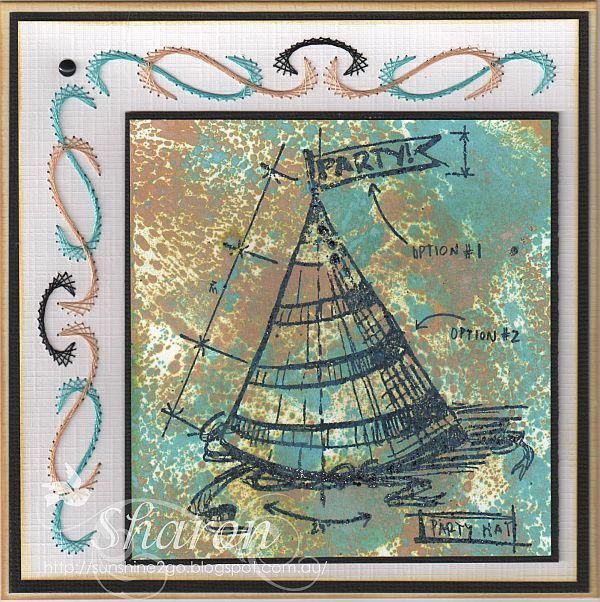 Outer die by Elizabeth Crafts, DottedScallops Squares-1175. 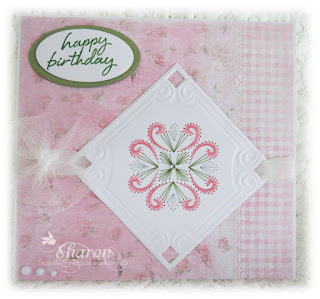 Poppy Stamps die "Eyelet Stitches. 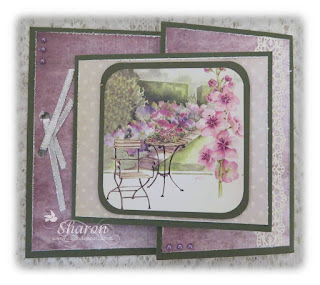 Image from Lili of the Valley art pad called "Garden Delight." It is a pity that you can no longer buy these beautiful pads. Wink of Stella was added to the flowers. I have been doing some much needed garden chores. I created the above birthday card for Annalie who lives in South Africa. The pattern is by Sjaak CO-2018-041 and is available from Ann's Paper Art. Threads are Mettler Polysheen 2152, 3921,5833. 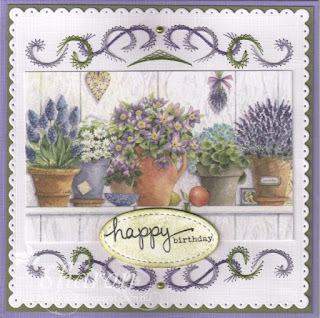 "happy birthday" by Atenew stamp. Die by Marianne Design LR0234. 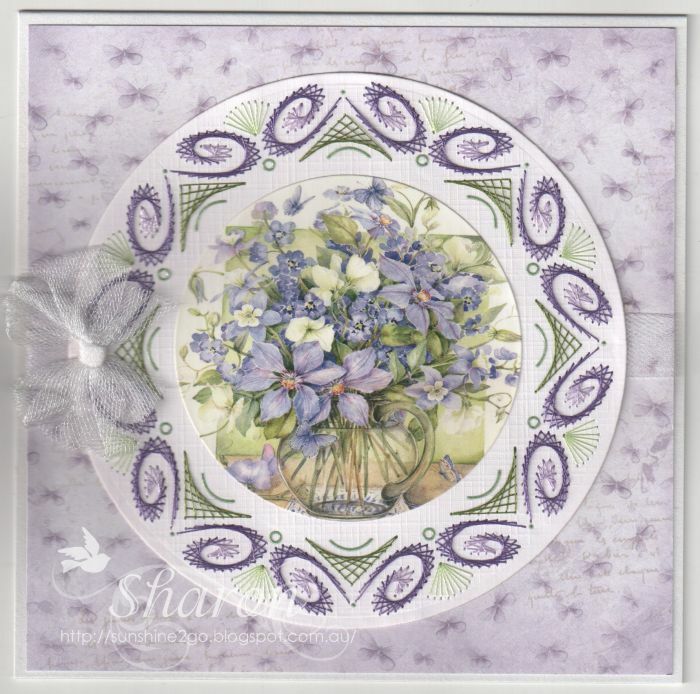 Oval die by Nellie Snellen MFD 057. Tulle has also been added. a bit of sunshine after a very wet week. Threads are Mettler Polysheen 2920, 3040, 5633. Ribbon and Hobbydots have been added. 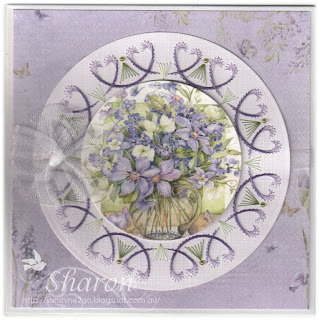 My friendship card for February was created especially for Sue in England. Pattern is by Sjaak CO-2017_040 which is available from Ann's Paper Art. Threads are Mettler Polysheen 1115, 2674, 3820, 5833. 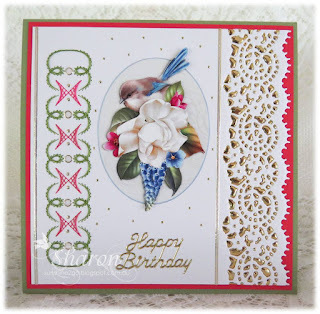 Image by Marianne Design "Birds" VK9554. Nellie Snellen circle die MFD100. I added tulle and bow which was coloured with distress ink Walnut Stain. Pearls and enamel embellishments have also been added. The hot week is over and we have a much cooler weekend with a breeze. I created this card for a very special friend. 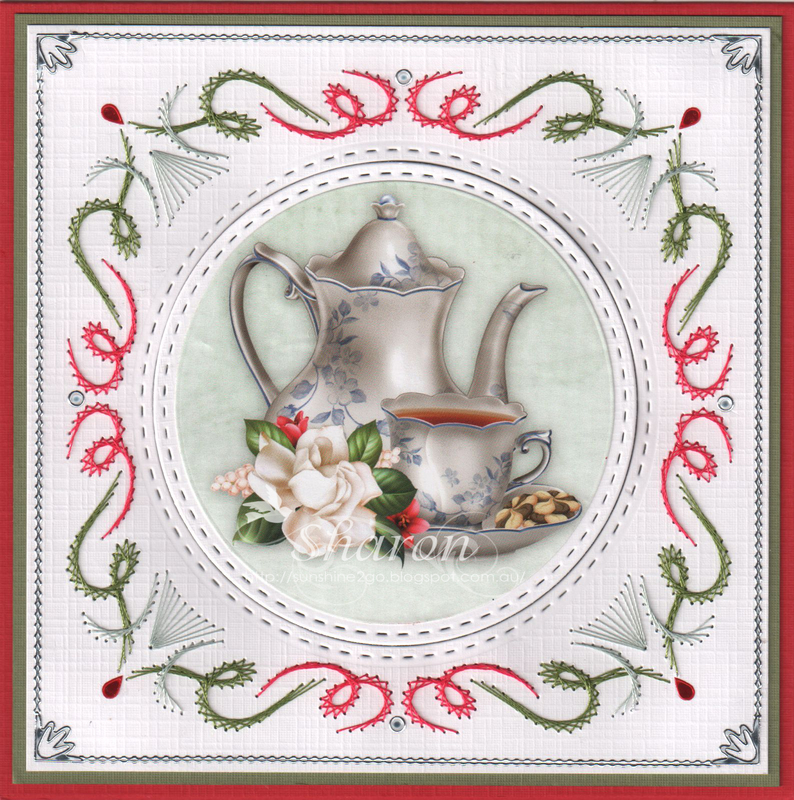 The pattern is by Ann's Paper Art and was published in the Hobbyjournaal 154. Threads are "Stitch and Do" 203 & 46 & Mettler Polysheen 0152. 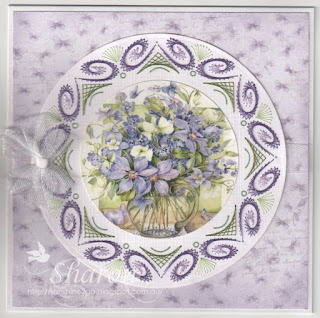 Decoupage by Find IT "Jeanine's Art" CD11003 - Butterflies and Flowers. Hobbydots and Peel off stickers have also been added. which we are very pleased about. This month was Matthew's birthday and this is the card that I created especially for him. Threads are Mettler Polysheen 0020, 0651, 4620. 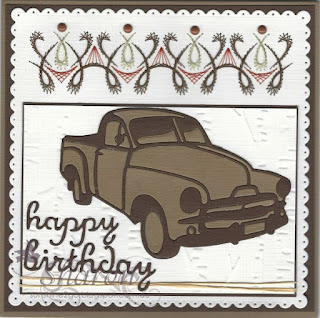 Stamp by Tim Holtz "Birthday Blueprint." Distress Oxide - fossilized amber, broken china. WOW! 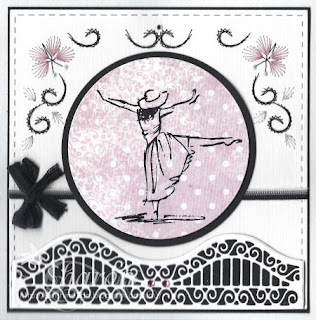 Black Twinkle embossing powder gave the stamped image a real sparkle. I also inked around the edge of the card with fossilized amber. 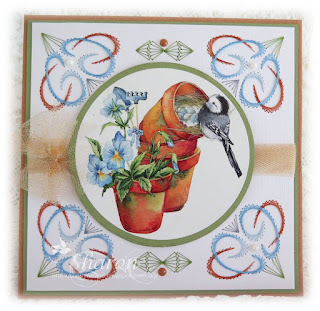 My friendship card for January was created especially for Annalie in South Africa. 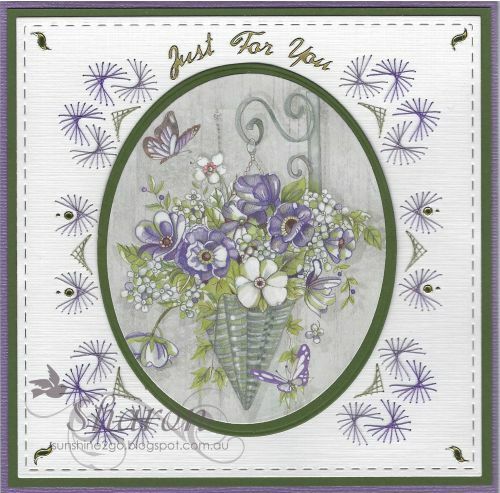 The pattern is by Sjaak C0-2017-038 and is available from Ann's Paper Art webshop. Threads are Mettler Polysheen 0176, 2320, 5833. Decoupage by Ann's Paper Art - Tea Time APA3D020. Circle die by Marianne Design CR1360. 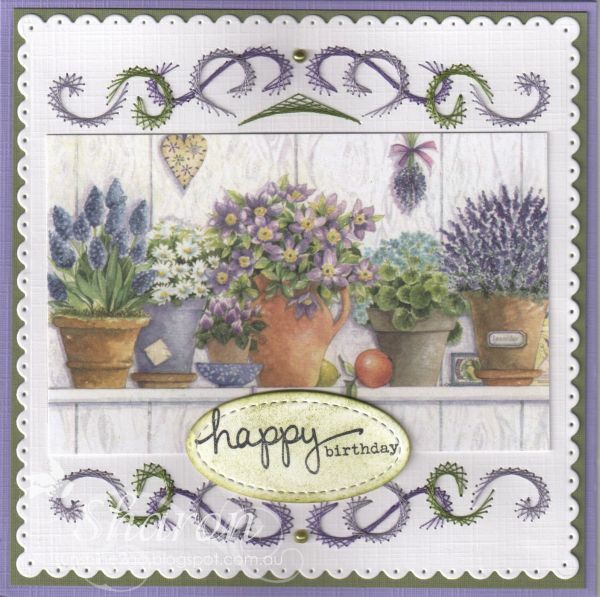 This month is Sue's birthday and this is the card I created especially for her. 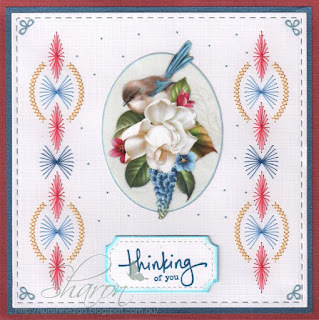 Pattern by Ann's Paper Art a655. Threads are Mettler Polysheen 4152. Dies by Sue Wilson CED1628 & Joy! Craft 6002/0245, 6002/0141. Distress ink - Broken China, Mustard Seed, Peeled Paint & Brushed Corduroy. Pattern paper by Studio Light. 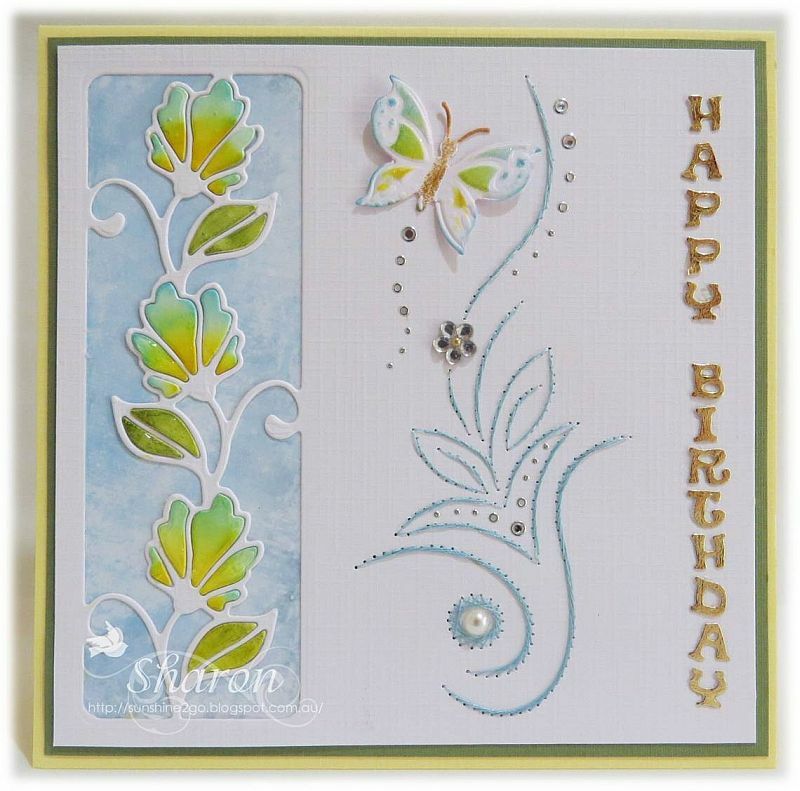 Pearls , hobbydots and flower gem have also been added. overnight before I inserted them back into the die cut to give them a glossy look. I hope that everyone is having a lovely week.